Gold ETF Funds and the Risk of Missing Bullion? It's become popular over the last decade to use Gold ETF Funds as a way to invest into the precious metal. Yet very few realise that not only do you not own any of the bullion but in nearly all cases their physical inventory is a good deal less than what they say they hold for you. Notwithstanding that there are many very questionable Gold ETF Funds on the market there are also some very sound and very reputable bullion trusts that I would use as a way to invest into gold bullion. 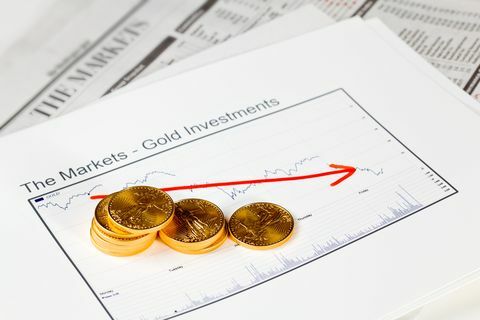 The following Trust differs to the standard Gold ETF Funds you will hear about, in that it's called a Closed End Trust and more closely resemble the mutual trusts that pre-date ETFs (Exchange-Traded Funds). It holds just under 100% fully allocated gold and silver bullion and you can also elect to have the precious metals delivered to you. There are no exotic sub-custodian arrangements or questionable audit procedures and they also have your bullion fully insured. Furthermore, an importance difference is that this Trust can issue you with certificates for your shares which the Gold ETF Funds cannot do. The following is what I believe to be the premier in this sector. Sprott has a fantastic track record as a financial investment company and the board are very well versed in what is going on in the bullion and financial markets. They are mandated to hold a minimum of 97% of the Trust's value in physical bullion (as at 30Sept2014 they currently hold 99.45% in gold bullion) which is fully allocated. The remaining value is kept in cash to facilitate the payment of expenses and potential redemptions / transactions. There is no minimum holding requirement for anyone wanting to ask for delivery and take physical delivery of their bullion. Due to their solid reputation, high integrity and operational reliability, their stock usually trades at a premium to the bullion they hold. They also have Trusts for silver and platinum & palladium. So what are the problems with the other Trusts then? In finance we are so used to dealing with paper and electronic information that we take the system for granted and don't stop to think about what it is fundamentally designed to represent. But when you do stop and look closely, you will see that nothing really sits behind your paper except more paper and frighteningly little of it is directly registered in your name. And to make matters worse, you rarely can get access to it. As the saying goes..."the devil is in the detail". That detail is within the various ETF's Prospectus, of which all have one. I suspect that many investors of Gold ETF Funds never knew a prospectus existed, let alone read it. Think of it as their Terms and Conditions of Business. It's only when you take the time to read them that you realise that in most cases, contrary to what is portrayed, you don't (and neither do they) actually hold much in the way of real tangible physical bullion assets. Something you already know is that a company's shares/stock represent a percentage ownership of the assets of that particular company. If the value goes up, so does your wealth and vice versa. Gold ETF Funds and ETFs in general, are different in that they merely track the prices of the relevant asset which are then represented as an 'Index'. So what is this 'Index'? These indices are synthetic units designed to track the value of a particular basket of shares or bonds and so have no real substance to them. They do not represent any real asset in the way a company's stock does. As such, you do not posses direct title to any asset in the basket nor as an individual do you have the option to have your assets directly registered into your name. For the simple reason that nothing exists to register. An indexed share basket is a portfolio that comprises of 'street name' shares contributed to by various stock brokers. The shares/bonds that make up the basket are those that were already previously bought by various brokers with other people's money directly investing into the stock market. It is important to understand that the money you give to the ETF providers does not go into buying any company shares off the stock market that make up that fund's particular share basket. Your fund is simply 'tracking' how well someone else's shares are doing. Neither the provider, stock broker or investor can be registered as an owner of any genuinely issued company stock if they just buy into the index. The institutions can liquidate and convert their funds' position into the underlying share basket but these have to be sourced from the stock market just like everyone else. It's on the basis of reduced price volatility that these indexed funds are marketed to the wide-eyed public looking for a safe bet as the indexes are effectively the average value of the stock market prices of the shares in that make up the basket. The providers also like to further highlight safety by offering segregated accounts. However, whilst there is no problem of the segregated accounts existing, the problem lies in that your accounts don't hold any actual assets as they side-step the real stock market shares entirely. So theoretically, all the companies in the share basket can go bankrupt but your segregated account relating to the index could still exist at full value. In reality though the index value will go to zero as the stocks that it's tracking don't exist any more. Never forget they are both wholly separate entities. The investor is technically just a book-entry with the provider showing you to be the beneficial owner / creditor of any realised value of the funds you originally sent to buy into that index. This also applies to the majority of Gold ETF Funds. So basically, you just gave all of your money to the provider/stock broker in return for a hollow averaged number which is simply re-issued to you as a paper or electronic statement of account. The reason the finance world is so eager to push and advertise them as viable genuine investments is because it is the easiest money for them to make. They take trillions in cash from the trusting public and literally give nothing of value in return. It's a terrifying example of the 'Emperor's Clothes'. Just wait and see what happens when everyone realises the true value of nothing. The emergency exits are just not going to be wide enough and virtually everyone using these entities will be burned, because who is going to buy 'nothing' from you the same way you did from the financial institutions? But What About the Gold ETF Funds? Gold ETF Funds (and Silver ETF Funds) are designed to buy physical gold bullion with the money you invested into them. Gold ETF Funds are then meant to track the value of gold bullion similar to the other indices mentioned. So on the face of it, with Gold ETF Funds you are buying shares in a product that has tangible asset with real value. Right? When buying gold bullion it is for long-term wealth preservation purposes and to increase the ratio of your money (gold/silver bullion) to currency (paper/electronic fiat). Keeping that in mind I will reference pages from the prospectus of the SPDR Gold Trust (NYSE Arca:GLD) which is the world's largest and most popular of the Gold ETF Funds. 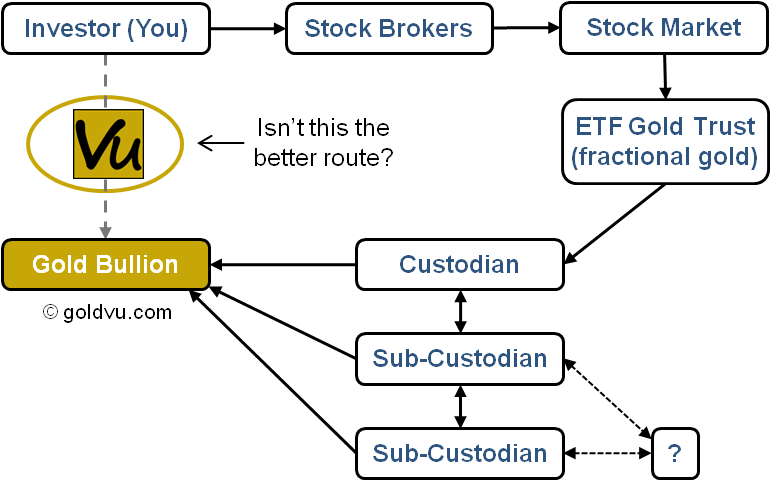 Each share in the Gold ETF Fund represents fractional (unallocated) gold. The quantity of gold that is represented by each share declines over time. Unlike normal corporate shareholders, a Gold ETF Funds' shareholder has no statutory rights. The gold Trust does not require that the custodians and sub-custodians insure the gold, so you could face total loss without compensation. No written contractual arrangements exist between sub-custodians that hold the Trust’s gold bars and the trustee or the custodian. Sub-custodians may in turn appoint further sub-custodians without permission from the Trust. The Trust has no right to visit the premises of any sub-custodian for the purposes of examining the Trust's gold bars or any records maintained by the sub-custodian to see if the gold exists. The above isn't the sort of thing that fills you with much confidence about the security of your investment. Just in case you don't believe me and think I am making-up the above, I have expanded on the above points further on below with excerpts from the SPDR prospectus including the relevant page numbers to aid you in your own due diligence. If after all that you are thinking that there must be a better way to invest into gold bullion then you would be correct. One way would be to personally buy and privately store your precious metal and the other way would be to get exposure by buying through one of the trustworthy trusts mentioned above. When it comes to Gold ETF Funds, I would only buy into those that provide allocated bullion (as opposed to fractional and unallocated) and where the Trust's shares are as close to 100% fully backed with precious metals as possible. This is something standard Gold ETF Funds don't do. And it's also highly preferable to have the ability to request and take delivery of your bullion if you so wish. You cannot do this with regular Gold ETF Funds such as SPDR as you need to be both an Authorised Participant and hold and redeem a minimum of 100,000 shares. This equates to 10,000 ounces of gold - which is no small sum. If you take action now to extract yourself from any standard ETFs you hold and move those realised funds into the 2 leading trusts mentioned at the beginning, then it'll be the first time your assets in this sector are safe and truly exist. Why not buy your own bullion and have it privately stored for you (preferably off-shore which is perfectly legal) where it's both unencumbered by any 3rd party and where your government can't touch it? If you want to buy physical bullion for either trading or simple wealth preservation purposes, then you can do so with just as much ease as you thought you could through ETFs. If you aren't sure what strategy is best for you then read our gold investment advice. But as with all physical bullion purchases you should understand what to look for and what to avoid and also how to do the all important due diligence. And finally, if you want to buy the real physical bullion, rather than the shares of the synthetic Gold ETF Funds, and have it internationally stored or delivered to you, then you can do this through GoldVu and access allocated physical bullion across 11 major precious metals markets at wholesale rates and quantities. Page 6: "The amount of gold represented by the Shares will continue to be reduced during the life of the Trust due to the sales of gold necessary to pay the Trust’s expenses"
"Each outstanding Share represents a fractional, undivided interest in the gold held by the Trust. The Trust does not generate any income and regularly sells gold to pay for its ongoing expenses. Therefore, the amount of gold represented by each Share has gradually declined over time." Two main points to take from the above excerpt. First is that the physical amount of gold per share of the Gold ETF Funds reduces with time so your purported holding is being eroded away. Second is that your gold is held on a fractional reserve basis. This means that you don't directly own any gold (the trust does) and that you are a only book-entry creditor of the trust. You always need to strive to have your gold bullion allocated. Page 8: "Shareholders do not have the rights enjoyed by investors in certain other vehicles. As interests in an investment trust, the Shares have none of the statutory rights normally associated with the ownership of shares of a corporation." So you have no statutory rights. 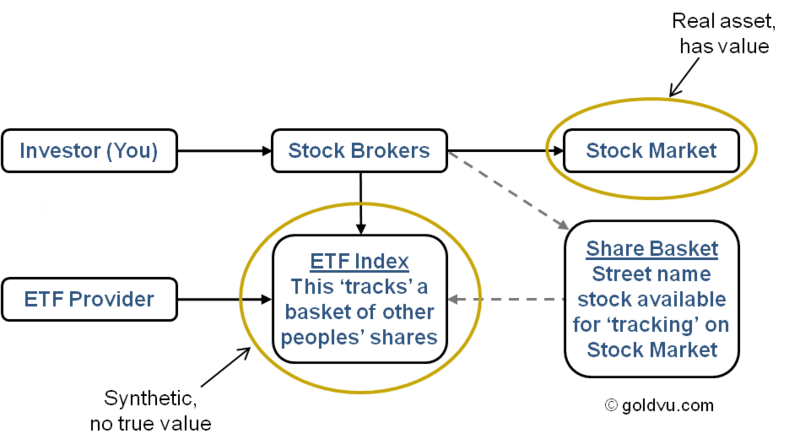 This reinforces what was shown in the earlier diagram that stock market shares and the synthetic index funds such as ETF gold trusts are 2 separate entities. You don't even enjoy the same rights and protection as a normal shareholder does. Page 9: "The Trust does not insure its gold. The Custodian maintains insurance with regard to its business on such terms and conditions as it considers appropriate which does not cover the full amount of gold held in custody...Shareholders cannot be assured that the Custodian will maintain adequate insurance or any insurance with respect to the gold held by the Custodian on behalf of the Trust. In addition, the Custodian and the Trustee do not require any direct or indirect subcustodians to be insured or bonded with respect to their custodial activities or in respect of the gold held by them on behalf of the Trust." None of your bullion is insured - there is no excuse for this. Everyone else that buys and privately stores bullion for you can offer you insurance. You could therefore be faced with total loss without compensation. Page 10: "Gold bars may be held by one or more subcustodians appointed by the Custodian...There are expected to be no written contractual arrangements between subcustodians that hold the Trust’s gold bars and the Trustee or the Custodian...In the event of a legal dispute with respect to or arising from such arrangements, it may be difficult to define such customs and practices...neither the Trustee, nor the Custodian would have a supportable breach of contract claim against a subcustodian for losses relating to the safekeeping of gold. If the Trust’s gold bars are lost or damaged while in the custody of a subcustodian, the Trust may not be able to recover damages from the Custodian or the subcustodian." The above section is quite a staggering admission by them - they don't have any written contracts in place with anyone that helps to look after the gold for them! How can any business, especially an ETF gold trust managing USD$30 billion of precious metals, not engage in any contractual agreements with any of its sub-custodians? You know, I wouldn't expect that from a Mickey Mouse operation run from the back of an old van! Page 11: "These subcustodians may in turn appoint further subcustodians, but the Custodian is not responsible for the appointment of these further subcustodians. The Custodian does not undertake to monitor the performance by subcustodians of their custody functions or their selection of further subcustodians. The Trustee does not undertake to monitor the performance of any subcustodian. Furthermore, the Trustee may have no right to visit the premises of any subcustodian for the purposes of examining the Trust’s gold bars or any records maintained by the subcustodian"
Above they are effectively saying that there could be a whole chain of sub-custodians looking after the gold and that the trust has no say in who is involved, it has no control over them, doesn't monitor them and can't visit the gold they are storing to audit to see if it really exists. Page 11: "Gold held in the Trust’s unallocated gold account and any Authorized Participant’s unallocated gold account will not be segregated from the Custodian’s assets. If the Custodian becomes insolvent, its assets may not be adequate to satisfy a claim"
If the trust goes bankrupt they are allowed to take your gold to pay off their debts. This is why it is essential to always have your gold bullion allocated directly to you.